Whether gardening in the arid climate of western Texas or the humid conditions in the eastern part of the state, gardeners can choose from a variety of fast growing evergreen vines. Evergreen vines can act as ground covers, screening or accents in hanging baskets or window boxes. With proper care, these vines will provide year-round interest to Texas gardens. Fast-growing English ivy (Hedera helix) only grows 3 inches tall, but will form a dense carpet over the ground or climb rapidly up fences, trellises or walls with its aerial roots. The leathery, lobed, dull green leaves come in many different shapes, depending on the variety. Some leaves may be heart-shaped, others curly or fanned. 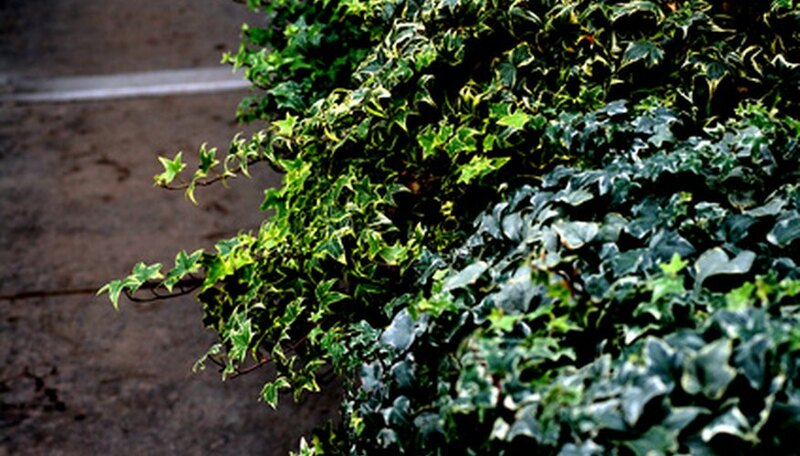 English ivy grows best in shaded areas and nutrient-rich soil. Space plants at least 18 inches apart and feed with a high-nitrogen fertilizer in spring and summer. Due to the rapid growth of English ivy, it requires pruning two or three times each year, which will also help to eliminate hiding spaces for slugs and snails. If desired, cut plants back to the ground with hedge shears in the spring. Lonicera sempervirens, commonly called coral honeysuckle, typically grows between 10 and 20 feet long. This twining vine blooms with bright red, trumpet-shaped flowers in late spring and bears orange or red berries in summer. The oval, medium green leaves have a bluish green tint on the undersides. Coral honeysuckle grows wild in eastern Texas but will grow in gardens throughout the state if provided with full sun, well-drained soil and regular water during extended periods of drought. Older, straggling plants often benefit from pruning if cut back before new growth begins in the spring. Aphids may appear on the foliage, but rarely cause significant damage and can be sprayed off with a strong jet of water. Star jasmine (Trachelospermum jasminoides) grows to 30 feet in length. The glossy, light green leaves reach 3 inches long and turn dark green as they mature. In summer, this vine teems with star-shaped white flowers, 1-inch wide, that attract bees and produce a pleasant scent. Star jasmine grows best in east, south, central and north Texas and may suffer in the dry conditions of western Texas. Plant this vine in full sun or partial shade and moist, well-drained, loamy soil. Fertilize before new growth begins in the spring and again after flowering and prune back as needed to control the size and shape of the vine. Inspect plants before purchasing for signs of scale insects or whitefly. If these pests appear in your garden, remove infested foliage or apply horticultural oils to the plant.